My bin of gift wraps is located at the back corner of our garage. Usually behind boxes. I’m too lazy to move things to get to it. So I made due what I can find around the house. Paper bags. Whether it’s the lunch sac or grocery size, I cut it up and wrap on the blank side. If you want to get creative, you can stamp, or tie with raffia (pictured above), or have your children doodle on it. Fabric. Use large pieces or sew together scraps or even just tie long scrap pieces around a plain boxed gift. Newspaper. 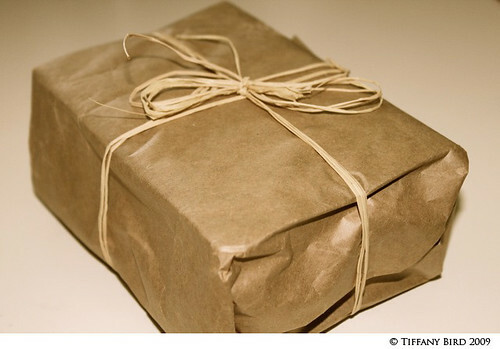 Not only is it great for fillers in packaging boxes, you can wrap and tie with ribbons. Packaging/packing paper. When your online purchase arrive at your front door in a box, make sure you save the paper inside used to protect the merchandise. Then reuse it to wrap your next gift. Magazine pages. Tape or glue multiple pages side by side if you need to wrap larger gifts. 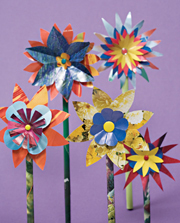 And try some of these flowers from Family Fun Magazine to adorn the gifts. What a good idea to use Newspaper,fabric and paper bags. What a way to save on money.